David Eicher delivers the 2018 George C. Benson Memorial Lecture at Miami University, Oxford, Ohio. On Thursday, April 12, I had great fun back in my hometown of Oxford, Ohio, where I was born, grew up, and went to school. The gracious folks of the Physics Department at Miami University, my alma mater, invited me to deliver the annual memorial lecture for the department, the George C. Benson Memorial Lecture. The lecture honors its namesake, George Benson, who was a very well liked postdoc at Miami in physics. He was killed tragically in a plane crash in early 1967. One of the highlights of the trip was having a dinner before the lecture with members of the Benson family, who were wonderfully interesting and kind. 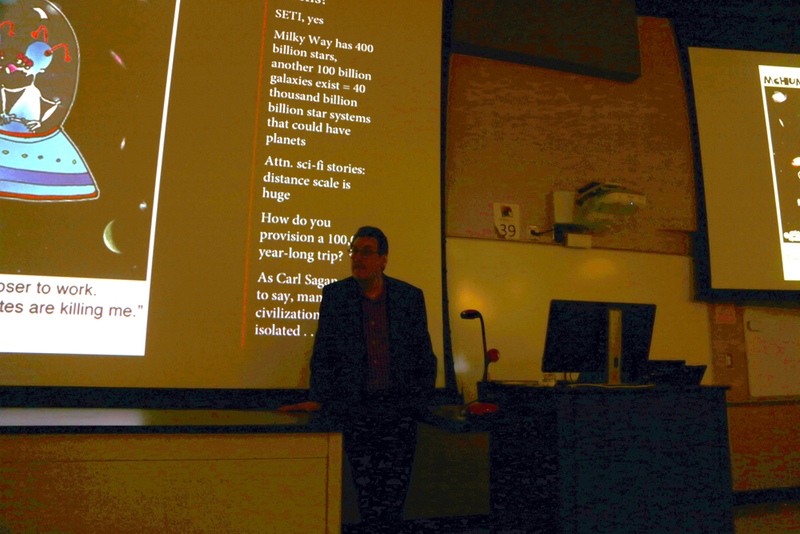 My talk, “The New Cosmos: Astronomy’s Ongoing Revolution,” took place on Thursday evening in a packed-house auditorium with Miami’s physics professors, undergrad and graduate students, and interested folks from around Oxford and the surrounding area. 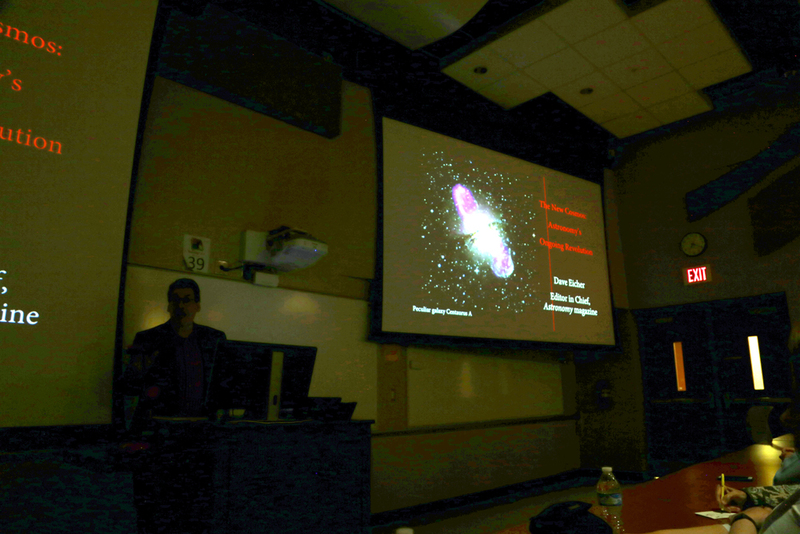 Echoing my Cambridge University Press book of the same title, I spoke about the origin of the Moon, the fate of life on Earth, the structure of the Milky Way Galaxy, the Big Bang, dark matter, dark energy, black holes, and other subjects — big leaps in our understanding over the past decade or so. The group was sensational and, just when I thought I had talked too much about all this stuff, they went on for a long time afterward with numerous questions. What a great crowd!! It was a real pleasure to return to my hometown and school to do this. Many thanks to those who made it possible: Physics Department Chair Herbert Jaeger, Professors Jennifer Blue, Steve Alexander, and Samir Bali, my sister Nancy Eicher, and many others of the physics department, including Mandy Pettit, who helped the make the trip happen. I will blog more about the visit as soon as I catch up here on the magazine front . . . Proud to be a Miamian.